Navajas is a tiny pueblito located 30 kilometers southwest of Guadalajara along the Circuito Metropolitano Sur highway linking Chapala-Guadalajara highway to Tala. I first wandered into Navajas about ten years ago. 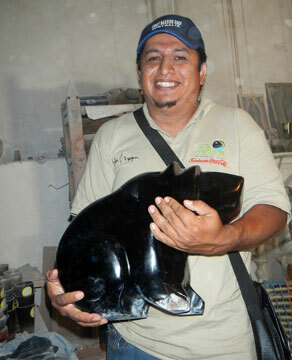 I had been told I would find a little workshop there where local craftsmen (and women) had revived an ancient Mexican tradition: that of creating works of art from obsidian, the natural volcanic glass which is found in such abundance here that Jalisco’s deposits rank fourth largest in the entire world. As I stepped through the narrow doorway, I guess I expected to see Mexican Michelangelos quietly chipping away at black rock with hammer and chisel. Instead, I was greeted by tumultuous roaring, screeching, buzzing and flapping, with great clouds of white powder filling the air. Out of the cloud stepped a thin man covered with dust, wearing a warm and peaceful smile. This was “Don” Eleno Espinoza, who, with his brother, started this backyard operation some 20 years ago. All the noise and dust came from numerous belt-driven grinding and polishing wheels, with which these craftsmen transform rough chunks of obsidian into creations of all kinds.